Exposure adds two amps to compact XM series | What Hi-Fi? The XM7 pre-amp and XM9 mono power amp join the XM3 and XM5 in offering big performance from a small package. Exposure Electronics has launched two new amps in its compact XM series, the new XM7 pre-amp and XM9 mono power amp. The range was launched at the start of this year with the XM3 phonostage and XM5 integrated amplifier. Like the XM5, the XM7 offers a built-in moving magnet phono stage and DAC, meaning you can use it with both digital and vinyl set-ups. 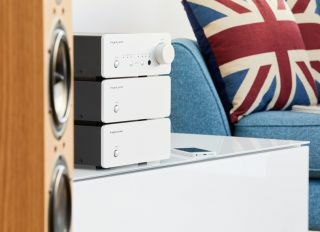 The DAC has five inputs, plus a fixed-gain home theatre input and two headphone outputs. You can also bi-amp, thanks to the two pre-amp outputs. Both the XM7 and the XM9 have a linear power supply with a large 200VA custom-made toroidal power transformer - this should make for cleaner sound quality compared with a switch-mode power supply. They also only use high quality resistors and capacitors in the signal path, with Toshiba bipolar output transistors being chosen for their superior dynamic performance. The XM7 and XM9 will be available from July, priced £1,240 for the pre-amp and £1,390 per pair of XM9s.